In her article “The Concept of Cinematic Excess,” Kristin Thompson speaks of a dual tendency in film criticism: we could see films as a “struggle of opposing forces,” some of which “strive to unify the work, to hold it together sufficiently that we may perceive and ‘follow’ its structures.” Outside of these structures “lie those aspects of the work which are not contained by its unifying forces – the ‘excess’” (Thompson, 54). What happens when this homogeneity-as-unifying-effect is thwarted by everything from shot length to mise-en-scène; performance to sound? 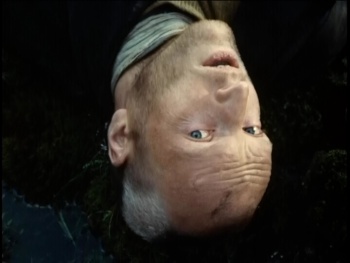 The text in question need not necessarily be a non-narrative experimental piece – Andrei Tarkovsky’s Stalker (1979) illustrates that a science fiction film can grow from the same excessive soil. Defamiliarization is at the heart of Tarkovsky’s cinema. 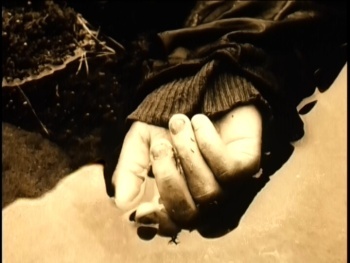 While we could point to instances of this tendency in various registers of his filmmaking practice, this essay will argue that, while Tarkovsky’s radical long take practice – as illustrated in two key scenes from Stalker – conforms to notions of creation-time,  the conjunction of this radical long take practice and the particular mise-en-scène creates a unique temporal defamiliarization. This particular strain of defamiliarization speaks to Thompson’s notions of cinematic excess, and therefore has the ultimate effect of renewing the perceptual freshness of the work, the world, and our inherent conceptions of temporality. Mise-en-scène is often a neglected area of inquiry in film studies. The setting in which action takes place is often effaced by questions of narratology, montage, performance, ideology, and history. 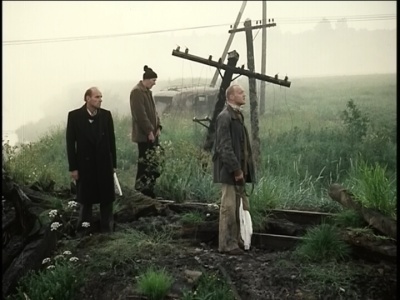 Tarkovsky’s Stalker , however, makes it impossible to contemplate any other aspects of the film’s textuality without necessarily contextualizing them within the film’s mise-en-scène. The film is premised upon the journey of three men: the Stalker guides a Writer and a Scientist through an ambiguous, post-apocalyptic terrain known only as the Zone. The group traverses the Zone in search of a room hidden deep within its labyrinthine passages that grants people their innermost wishes. While the film is premised upon a physical quest in space and time, the film has a deeper, inarticulable spiritual thrust. Essentially, “ Stalker is structured as a physical/metaphysical journey for three men in search of inner truth and self-worth” (Totaro, 242). The men trek through forest and ruins; tunnels, waterfalls, interior sand dunes, and myriad other disparate terrain. While the Zone appears on a surface level to conform to our experience of the natural world, it quickly becomes apparent –as we will later see in two specific sequences– that the laws of nature as we know them do not apply. Mise-en-scène is foregrounded as “Tarkovsky arranges the objects and actors within the frame in such a way that the mise-en-scène defies physical laws as well as ordinary credibility” (Petric, 31). The Zone is not only perceptually baffling, but also poses very real dangers and threats to the lives of the group. Essentially, the Zone is a minefield of perceptual illusions, booby traps, and shifting geography, making each step a potentially life-threatening danger” (Totaro, 242). The constant negotiation of the Zone’s obstacles wears on the men, their spiritual malaise that provoked their journey becoming more intense as they journey forth. Indeed, “life in the Zone knows no rational progress, only constant toil, fatigue, and anxiety in the face of the uncertain… Our protagonists advance toward the unattainable through an abandoned, overgrown, and rain-soaked landscape or decaying underground caverns” (Biro, 161). As Tarkovsky presents this landscape in exclusively long takes – and since cause and effect defy scientific laws, as we will see in further discussion of specific sequences – temporality is foregrounded, giving the mise-en-scène a heightened, subtly-supernatural, defamiliarized quality. Indeed, we see that “Tarkovsky’s rain, fire, fog, wind, and earth are experienced on the screen as cinematic phenomena rather than perceived as a natural power” (Petric, 34). The Zone is at once nature and super-nature. It extends beyond the individual; a metaphor for the expanse of the Universe. At the same time, it could be read as existing within the consciousness or subjectivity of any of the characters or spectators. The Zone is timeless, existing outside of the confines of conventional spatio-temporality, cinematic or otherwise. Essentially, “events do not simply take place in the external world, but rather in profoundly experienced spirituality” (Biro, 158). While a detailed summary of Gilles Deleuze’s film philosophy is clearly outside the scope of this essay, a discussion of temporality and mise-en-scène merits a mention of his concept of the ‘any-space-whatever.’ In a nutshell, Deleuze believed that, around the advent of neo-realism in the late 1940s-early 1950s, cinema saw a shift from a textuality that privileged cause-and-effect-based classical narration, to an image that foregrounded temporality, subjectivity, and observation. Essentially, the shift from the ‘movement-image’ to the ‘time-image’ represented the emergence of “a cinema of the seer and no longer of the agent “ (Deleuze, 2). The futile mission at the heart of Stalker could be read as the ultimate illustration of the result of this shift. The three men are engaged in an attempt to reach the wish-fulfillment room – the Scientist, secretly equipped with a bomb meant to destroy said room, is especially action-oriented. However, Tarkovsky thwarts any notion of cause-and-effect narrative at every turn. Instead of seeing the men actively confront and vanquish their obstacles, we see them constantly mired in self-doubt, despair, and philosophizing. They are stripped of agency as they lay motionless for long periods in various terrains. They are observers rather than actors. They conform to Deleuze’s notion of Time-Image protagonists when he states “it is now that the identification is actually inverted: the character becomes a kind of viewer. He shifts, runs and becomes animated in vain, the situation he is in outstrips his motor capacities on all sides, and makes him see or hear what is no longer subject to the rules of a response or an action. He records rather than reacts. He is prey to a vision, pursued by it or pursuing it, rather than engaged in an action” (3). With the receding of character agency and action comes privileging of mise-en-scène. According to Deleuze, “objects and settings [milieux] take on an autonomous, material reality which gives them an importance in themselves. It is therefore essential that not only the viewer but the protagonists invest the settings and the objects with their gaze” (4). In Stalker , “it is as if the action floats in the situation, rather than bringing it to a conclusion or strengthening it” (4). Reading Tarkovsky’s Stalker as the ultimate Time-Image film has implications when it comes to questions of subjectivity. When the men venture into the Zone, the viewer begins to question notions of truth, reality, and point-of-view. However, it quickly becomes apparent that these questions are irrelevant: it does not matter whose subjectivity the images result from, or what the ontological status of the Zone is. Tarkovsky’s privileging of languid temporality, and the resultant defamiliarization of space and time highlights the inner journeys of the men, making any question of ‘solving’ the ‘mystery’ of the Zone irrelevant. Instead, “the distinction between subjective and objective… tends to lose its importance, to the extent that the optical situation or visual description replaces the motor action. We run in fact into a principle of indeterminability, of indiscernibility: we no longer know what is imaginary or real, physical or mental, in the situation, not because they are confused, but because we do not have to know and there is no longer even a place from which to ask. It is as if the real and the imaginary were running after each other, as if each was being reflected in the other, around a point of indiscernibility” (7). This point of indiscernibility privileges durational aesthetics: while, on one hand, the Zone could be regarded as a science fiction fantasy world with no basis in the ‘real world,’ it could also be read as the ultimate depiction of reality: the human subjective dream-scape. Whichever reading one opts for is irrelevant – the questioning is the point. Landscape, mise-en-scène, and the ontology of the cinematic image is defamiliarized and made strange through Tarkovsky’s juxtaposition of a radical long take aesthetic and troubling of cause-and-effect and spatial relations, as we will see in a further discussion of two sequences. The Zone becomes an ultimate embodiment of Deleuze’s conception of a depersonalized space that makes rooms for the troubling of classical notions of space and time: the ‘any-space-whatever.’ The Zone is an example of “the first form of the any-space-whatever: disconnected space. The connection of the parts of space is not given, because it can come about only from the subjective point of view of a character who is, nevertheless, absent, or has even disappeared, not simply out of the frame, but passed into the void” (8). The Zone is the void, into which all three men pass and transcend. Tarkovsky, the quintessential filmic ‘sculptor of time,’  clearly sees time as the most important aspect of the medium, as “it is inherent to cinema…It pulsates through the blood vessels of the film, making it alive through various rhythmic pressures” (Tarkovsky, 114). While some may equate filmic temporality and rhythm with fast-paced montage aesthetics, the radical long take –and its privileging throughout an entire filmic text, as is the case with Stalker – lets the rhythmic pressures slowly bore into the spectator’s consciousness in a more subtle and organic fashion. The subtle rhythm of the radical long take is privileged in the image. Yvette Biro states “the breath and the heartbeat of time is either pulsating in the visible image or it does not exist at all. Other components, such as editing, visual effects, sound, and the actors’ performance, are all secondary – all that is alive is manifested by the rhythm of the image” (Biro, 159). One can see style’s relationship with temporality as an instance of what Totaro defines as ‘creation-time;’ the subtlety of pace allowing for an awareness on the part of the spectator of more than simply cause-and-effect, action-based narrative structures. Instead, “as Stalker progresses, time in the long take becomes an expression of creation and invention. Through the slow unfolding of time in the long take, the audience experiences, sometimes along with the characters, the sense of something magical or wondrous occurring in their presence” (Totaro, 244). Dream, supernatural occurrences, science-fiction tendencies, whatever: it is all ambiguous, it is all excessive, it is alldefamiliarizing. The privileging of ‘creation-time’ allows for new ways of absorbing the cinematic image. We see things differently when we see them slowed down. Indeed, “the deliberate and extremely slow camera movements in Stalker , in concert with character stasis and little kinetic energy, function to retard our normal perception of time; they alter the convention of ‘normal’ or ‘physical’ time (our perceptual schemata), by reducing movement to a speed alien to most film viewing experiences” (Totaro, 249). 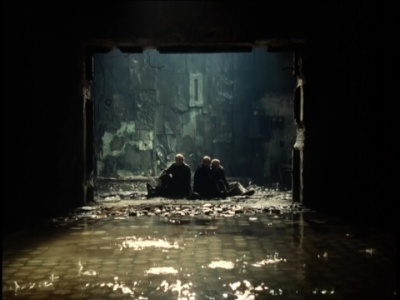 This altering of perceptual schemata in terms of the troubling of conventional notion of cinematic space and time is most apparent in two sequences in Tarkovsky’s Stalker . Following the work of Vlada Petric, Donato Totaro describes two types of camera movement in Stalker : “lateral movements with telephoto lenses that obscure all but one plane of the image and overhead perpendicular tracking movements over objects and spaces (often nature)” (Totaro, 248). This is used emphatically in many instances in the film. One such exemplary instance would be the tracking over the stream (of consciousness) during the Stalker’s dream (Totaro, 260) (Disc 2, 00:18:06 – 00:21:36). The female voice-over (the Stalker’s wife) describes the destruction of Heaven and Earth from Revelation 6:12-17, (Totaro, 258) giving the sequence an overt reference to the ambiguous eschatology that the entire film implies. The camera is focused on a close-up of an indistinguishable object before tilting up to show us the sleeping face of the Stalker. 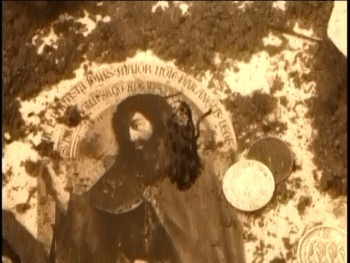 Tarkovsky’s camera then pans away to follow a clear, shallow stream in an extremely slow perpendicular tracking shot that reveals the mysterious collection of random debris submerged in the stream: “a hypodermic needle, a chrome plate, a small fish in a bowl, an aluminum box containing dirt and coins, a screwdriver, a Christ Icon… a pistol, black and white tiles, a spring coil, pages of a calendar, a clockwork mechanism, and…an upturned hand resting in the water” (Totaro, 259). We are led to believe that this is the Stalker’s hand, which is spatially incoherent. However, since we are already aware of the Zone’s spatial trickery and the dreamlike qualities of the mise-en-scène, we can infer that this is yet another instance of Tarkovsky’s creation of an excessive diegetic universe through radical long take practice in conjunction with a defamiliarized mise-en-scène. The intricate interplay of temporality, mise-en-scène, and cinematic excess is taken to the extreme in the Writer’s interaction with the well (DISC 2. 37:19 – 00 :42 :46). In this instance – and we could generalize this to the film’s totality – “time functions to let things happen in front of the spectator’s eyes, to ‘surprise us’ in the same way that the three characters are surprised by the physical surrounding of the Zone” (Totaro, 261). The sequence begins with an extreme long shot of the sleeping writer lying in the midst of the sand dunes, a well in the background. He wakes, takes hold of a stone, and lets it fall into the well. We hear a thud; the sonic assumption of the stone’s contact with the dry well-bottom. However, a few seconds later, we hear another sound: this time, a splash. This scene problematizes cause and effect to the extreme, presenting perhaps the quintessential illustration of a Deleuzian Time-Image. The Writer reacts to this occurrence by stating ‘there is no such thing as facts, especially here.’ From extreme long takes, to excruciatingly slow camera movement, to the overt problematizing of space and time, we can see how Tarkovsky’s Stalker revels in a unique distanciation that is premised upon multiple incarnations of temporality. The complexity of this sequence, and the specific Tarkovskian temporal estrangement that it represents, “is centered in the way it encapsulates the film’s formal and thematic integration of time” (Totaro, 268). We could say that “time and the long take fuse form, theme, and philosophy in Stalker ” (Totaro, 270). I would add to this by arguing that temporality and mise-en-scène in turn fuse to create a unique Tarkovskian distanciation-image. Vlada Petric describes the Tarkovskian image as one which “looks ‘estranged,’… rendered obliquely in order to suppress the ‘dramatic’ meaning of the event, while getting the viewer involved with meanings hidden beneath the narrative level. Encouraged to search for something beyond the image as an analog of reality, allowed to ponder upon the presented events/objects, the viewers engage in their own reflection upon what they perceive on the screen” (Petric, 29). Petric believes that this relates to Tarkovsky’s privileging of features characteristic of dream process. Cinematic imagery that is reminiscent of dreams – in whatever form – would unquestionably be instances of filmic distanciation, defamiliarization, excess. Totaro privileges notions of camera movement in his discussion of Tarkovsky’s particular brand of defamiliarization, stating “the agonizingly slow camera movements inward are a form of ‘temporal estrangement,’ largely because we have no physical correlative in our real-life experience of moving at such a retarded pace” (Totaro, 248). I would add that it is the unique fusion of radically slow pacing (in terms of both camera movement and shot length), and mise-en-scène that allows Tarkovsky’s particular excessive tendencies to be foregrounded. While common parlance would define ‘excess’ as that which is ‘too much’ in form, style, content, theme, etc., excess can also be seen as that which is, in a manner of speaking, ‘not enough.’ By this I mean the inarticulable space that resides outside of the domain of cinematic, textual, or verbal language. I would argue that cinematic excess resides in duality; in the space between two terms, as the nearly inarticulable zone outside of a dialectic synthesis. Following the Russian Formalists, Roland Barthes, and Stephen Heath, Kristin Thompson defines excess as what lies beyond the “forces that strive to unify the work, to hold it together sufficiently that we may perceive and ‘follow’ its structures” (Thompson, 54). Essentially, we could say that excess is that which ‘exceeds’ narrative convention. Her theorization of cinematic excess is premised upon Barthes’ piece, “The Third Meaning.”  In a nutshell, the premise of Barthes’ article is that any image is made up of levels of meaning, and that the third meaning is excessive. This analysis is integral to the following theorization of cinematic excess by Heath and Thompson, and therefore warrants an explanation. The first level of meaning Barthes proposed was an informational level. This gathers together everything that the spectator can learn from the setting, the costumes, the characters, their relations, and their insertion into an anecdote. This is the level of communication; in semiotic terms you could call it the message. The second level of meaning, the symbolic, can be termed ‘signification’ in semiotic terms, and is made up of diegetic, authorial, and historical symbolism. However, one is still captivated by the image, even after analysis of the informational and symbolic levels. The image exists on yet another plane, and the viewer receives a third level of meaning, that which is “evident, erratic, obstinate” (Barthes, 53). He calls this third level of meaning that of obtuse meaning; Thompson calls it cinematic excess, eschewing the use of the term ‘meaning’ since it is exactly that which defies articulation in the conventional sense. Thompson claims that Classical Hollywood film “typically strives to minimize excess by a thorough going motivation” (Thompson, 54-55), whereas other films outside this tradition leave their potentially excessive elements more noticeable because they do not always try to provide apparent motivation for every element of the film. While it is true that “no element in a work is strictly excessive to the degree that it has no connection to other elements” (56), the loosening of links in a causal chain calls excess to the fore. She claims that “excess is not only counternarrative; it is also counter-unity. To discuss it may be to invite the partial disintegration of a coherent reading. But on the other hand, pretending that a work is exhausted by its functioning structures robs it of much that is strange, unfamiliar, and striking about it” (57). Films like Stalker – and I believe you could generalize this to include the entirety of Tarkovsky’s body of work – resists any notion of classical narrative unity and coherence. His privileging of radical temporality, disjunctive spatial relations, and ‘super-nature’ mise-en-scène revels in Thompson’s conception of cinematic excess, privileging the strange, the unfamiliar, the dreamlike, and the striking. At this point, I have illustrated that Tarkovsky’s Stalker is quintessentially excessive in its very depiction of space and time. However, this begs the questions such as ‘why bother with excess at all?’ Why should we attempt to define the undefinable; to articulate the inarticulable; to analyze that which is beyond analysis? What is the critical value of a discussion of cinematic excess? …it suggests a different way of watching and listening to a film. It offers a potential for avoiding the traditional, conventionalized views of what film structure and narrative should be – views which fit in perfectly with the methods of film making employed in the classical commercial narrative cinema. The spectator need not assume that the entire film consists only of the unified system of structures we call form and style; he/she need not assume that film is a means of communication between artist and audience. Hence the spectator will not go to a film expecting to discern what it is ‘trying to say’, to try to reassemble its parts into some assumed, pre-ordained whole (Thompson, 62). Essentially, being aware of excess, and the resultant reluctance to privilege cause-and-effect Classical narrative above all other aspects of a filmic text, opens up the text and facilitates a more engaged spectatorship. And this engaged mode of spectatorship is essential when it comes to viewing a film such as Stalker . Tarkovsky’s treatment of time and space opens us up to the realization that “the only subjectivity is time, non-chronological time grasped in its foundation, and it is we who are internal to time, not the other way round” (Deleuze, 82). 1 The terms and concepts ‘radical long take practice’ and ‘creation time’ are taken from “Chapter 9: Radical Long Take Practice: Andrei Tarkovsky’s Stalker ” from Totaro, Donato. “Time and the Long Take in The Magnificent Ambersons , Ugetsu , and Stalker ” (Ph.D. Dissertation, University of Warwick, 2002): 242-287. 2 See Deleuze, Gilles. Cinema 2: The Time-Image. Trans. Hugh Tomlinson and Robert Galeta. London: The Athlone Press, 1989. 1-13. 3 Tarkovsky, Andrei. Sculpting in Time: Reflections on the Cinema. Kitty Hunter-Blair, Trans. London: The Bodley head, 1986. 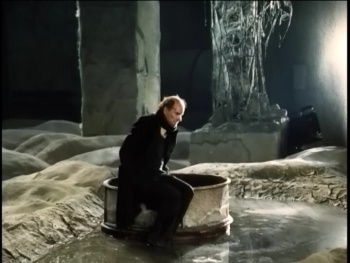 4 While Deleuze speaks of neo-realism, I believe this translates extremely well to this sequence in Stalker in which “the sensory-motor connections are now valid only by virtue of the upsets that affect, loosen, unbalance, or uncouple them: the crisis of the action-image” (Deleuze, 6). 5 Dream-process imagery includes “the bizarreness of the situation, strong physical motion, obfuscated peripheral vision (elimination of the image’s borders), the flickering effect (light pulsation), an unexpected change of chromatic tonality, spatial-temporal discontinuity, pictorial distortion of objects, decelerated motion, a fluctuating focus (blurring)” (Petric, 29). 6 Barthes, Roland. “The Third Meaning.” Image-Music-Text. Trans. Stephen Heath. New York: Hill and Wang, 1977. Barthes, Roland. “The Third Meaning.” Image-Music-Text. Trans. Stephen Heath. New York: Hill and Wang, 1977. Biro, Yvette. 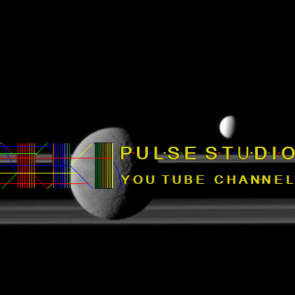 Turbulence and Flow in Film: The Rhythmic Design. Bloomington & Indianapolis: Indiana University Press, 2008. Deleuze, Gilles. Cinema 2: The Time-Image. Trans. Hugh Tomlinson and Robert Galeta. London: The Athlone Press, 1989. Petric, Vlada. “Tarkovsky’s Dream Imagery.” Film Quarterly. 43.2 (Winter, 1989-1990): 28-34. Stalker . Dir. Andrei Tarkovsky. 1979. DVD. RUSCICO, 2000. Tarkovsky, Andrei. Sculpting in Time: Reflections on the Cinema. Kitty Hunter-Blair, Trans. London: The Bodley head, 1986. Thompson, Kristin. “The Concept of Cinematic Excess”. Ciné-Tracts Vol. 1, no. 2 (Summer 1977) 54-63. Totaro, Donato. Time and the Long Take in The Magnificent Ambersons, Ugetsu and Stalker (Ph.D. Dissertation, University of Warwick, 2002).